If your potty trained dog has suddenly begun urinating in the house or dribbling urine, he may be incontinent. Dog incontinence causes vary but identifying the cause can help you find the right treatment options for your pet. Before understanding dog incontinence causes, you need to know what the condition is. Incontinence happens when a dog loses control over their ability to stop themselves from urinating. As a result, they may urinate a little while walking or playing in the house without even realizing they have done it. Incontinence is not the same as frequent urination which happens because the dog is overproducing urine and needs to go outside more often to relief himself. The latter condition can be caused by kidney failure n dogs diet. Incontinence generally has other causes. Dog incontinence causes depend somewhat on the age of the dog. Senior dogs, for example, can literally become senile and can urinate without being consciously aware of what they are doing. They also lose muscle control so they may be unable to hold in the urine until they are safely in an approved potty spot. For older dogs, dog incontinence diapers can be an effective treatment that lets them remain indoors while also giving the owner’s some peace of mind. A dog bladder infection may sometimes seem to cause incontinence because the condition can cause dogs to urinate indoors. With the infection, the dog simply has a stronger need to urinate and may not be able to wait; therefore, urinating indoors becomes a last resort. With incontinence, the dog isn’t even aware he is urinating. Dog incontinence pads can be used effectively to help with other causes of the condition, including congenital causes, hormone causes (following neutering or spaying), and blockages of the urinary tract, which other treatments are being used, too. 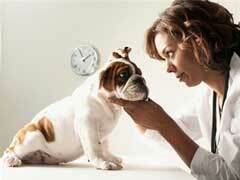 Surgery can help the former and the latter dog incontinence causes. Hormone therapy may be needed to reduce incontinence following sterilization, however. If your dog is beginning to urinate where he shouldn’t, visit your vet to identify the dog incontinence causes and decide on an appropriate course of treatment.